At the 2012 Treatment Free Beekeeper’s Conference in Leominster, MA, one of the things shown was a top bar hive honey harvest. After seeing this I was sold on top bar hives and had to have my own. Watch as Sam Comfort from Anarchy Apiaries demonstrates how easy it is to harvest honey. Notice his tattoos? Nothing screams beekeeper like a giant queen bee tattoo on your arm! My favorite part is seeing the tools Sam uses. Does he have a hive tool? No, it’s a pocket knife. Does he have a smoker? No, it’s a lighter, a leaf and his breath. Does he have a bee brush? No, it’s a twig with leaves and then later a feather (which is what I use). Does he have a bee suit and veil? No, of course not, it’s Sam Comfort after all. Sam’s smoker – a lighter, a leaf and his breath. He does however use a bucket with a lid to collect the honey. That is something definitely needed. Here is the honey he harvested off the bar. Honey harvested from the top bar hive. After the honey was cut into the bucket, Sam shows what is left on the top bar. Sam showing what is left on the bar after he harvested the honey. Then he merely walked over and put the bar back onto the hive. The honey in the bucket can be used as cut comb honey or processed via crush and strain. Sam usually uses one of the top bars from the hive to do the crushing. Sam is an icon for what little is actually needed to be a successful beekeeper. He keeps around 500 hives in New York, Florida, Hawaii and a few other places and is successfully breeding treatment free bees. Here are a few more pictures from the demonstration. Just click on a picture to open the gallery. Then click on the arrow to scroll through the pictures. Sam Comfort from Anarchy Apiaries looking at his bees from his top bar hive. Check out his giant queen bee tattoo. Just awesome! Sam Comfort from Anarchy Apiaries looking at his treatment free bees. Sam pointing to brood on the frame. Sam Comfort going through his bees in the top bar hive. Sam Comfort with his top bar bees. Sam Comfort turning the bar to look at the comb. Sam Comfort talking to Dean Stiglitz while brushing bees off the frame with a feather. Sam Comfort returning the bar to his hive. This post was linked to Homestead Revival. Can’t seem to find the “gallery” of pix. when i click on the individual pix each one expands, that’s all. Bruce there should be arrows that show up all the way on the right hand side of the screen that look like this >. Do you see those? Click on that and it should take you through the gallery. This is a different format than I’ve used before so please let me know if it is still not working. Thanks! I want one of those hats!!!! I have always said I didn’t want a tattoo, but Sam has made me at least consider the idea!!! 🙂 I looked at his site just briefly and realized I am going to need more time tonight after I get home from work. There is a lot of stuff there. Is this conference a yearly thing? Please keep posting info about it anything and everything you have learned there. Thanks for informing us about something we may have never heard of. Yes. There is usually one treatment free conference in Mass in the Summer and one in March in Arizona. If you look at Dean’s website under videos http://beeuntoothers.com you can find videos from two previous conferences. Great video!! I have lost 6hives over the years ! 1/2 were wild swarms.I am done!! I never use pesticides on anything and all that I plant in my yard has to benefit bees, us and our chickens. I just received from my sister an article on how Lowes and Home Depot’s plants are sprayed with neonictides!! A gal behind me has a hive and I am seeing her hive slowly go down hill. I have also seen a steep decline in bumble,carpenter and other wild bees. My husband and I are trying to find acreage out of the sacramento valley..hopefully then I can start new hives. This has to be a main reason for bee decline! Home Depot and Lowes sell heirloom plants but I have stopped buying anything from them ..I cant believe that they dont warn us of neonictides use..a known insect killer!!! Hi Anne, I’m sorry you are having trouble keeping your bees alive, beekeeping can be really disheartening at times. I have seen entire apiaries decimated from pesticides and it really sad to see. Many things can cause them not to survive, but if you suspect it is from disease or pesticides you can send in a sample for analysis which you can read about here http://www.beverlybees.com/prepare-samples-bee-disease-diagnosis/. Also if you are buying plants for bees once you find your new bee sanctuary, try to buy organic plants which will not be treated. 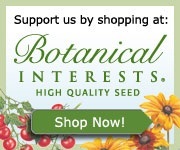 As an alternative to buying organic, here is a great website to refer to which shows you lists of places where you can buy bee safe plants and seeds. http://nativebeeranching.com/sources-of-untreated-plants/ and http://nativebeeranching.com/sources-of-untreated-seeds/. This way when you get your new land you can make sure you are planting safely for bees.